3B Medical has recently launched a CPAP & accessories cleaner that uses UV light to clean and disinfect these personal items. The cleaner allows you to introduce the mask or the water humidifier chamber into the cleaner’s drawer and within 5 minutes the Lumin perfectly disinfects the items. The Lumin is also perfect for disinfecting other personal hygiene items such as the nebulizer, a hearing aid, or kid’s toys and accessories. The Lumin CPAP cleaner uses safe UV light to get rid of all the pathogens and bacteria that are present on the items you place into the cleaner’s drawer. UV light is a widely used sanitation method in hospital environments and sterile places. The UV light is the safest alternative to other disinfection methods that involve high hazard chemicals. In order to ensure maximum safety, the Lumin will shut off automatically whenever the drawer is opened- in order to protect against exposure to UV light. The Lumin CPAP cleaner will efficiently sanitize all your required items within 5 minutes. When you take them out of the drawer, you can immediately use them. There is no need to allow the items to dry, or wait half an hour until you can safely use your equipment. When the cleaner signals the end of the sanitation cycle, simply take out your items from the tray and enjoy high-quality therapy at any moment. 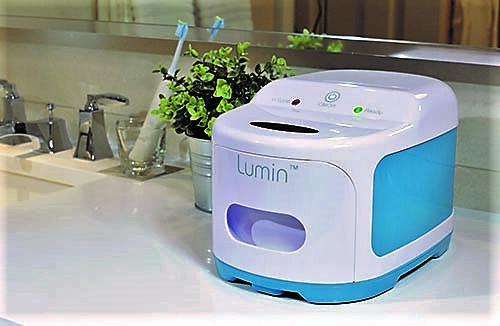 The best thing about the Lumin is that you can use it to sanitize other items than your CPAP equipment- a toothbrush, a hearing aid, your dentures or a child’s toy. You can use the sanitizer to disinfect any required item that safely fits into the drawer of the cleaner. Using your sanitizer on a regular basis will ensure that you or your family members use personal hygiene items that are free from harmful pathogens. Most of the similar cleaners on the market will require regular maintenance and some replacement parts. This means you need to continually invest in your device, but the Lumin requires none of these. 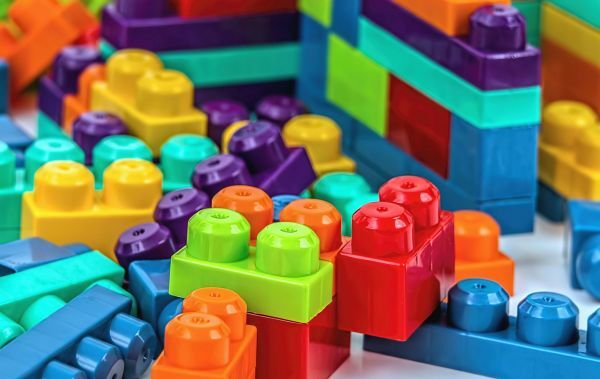 You only have to make a one-time investment – the cost of the device- and that’s it. There is no need to buy spare filters, or change bulbs with the Lumin CPAP cleaner. The Lumin CPAP cleaner weighs about 5.5lbs and its measurements are 12.25”L x 8.5”W x 7.75H. As you can easily note, the cleaner will fit nicely on your nightstand or in the bathroom. You can place it anywhere, as it takes up little space and it has an unobtrusive design making it blend well with any ambiance. It is important to keep in mind that the sanitizer cannot remove dirt and debris from the surface of your items. It will kill all the bacteria and fungi residing on the surface, but you need to manually clean the debris from the surface of your mask, water chamber, etc. The tray inside the Lumin CPAP cleaner is aluminum coated. Whenever this tray requires cleaning, you just need to carefully wipe it with a soft damp cloth to remove any dirt particles from its surface. Never use harsh chemicals such as abrasive detergents to clean the tray or the outer body of the Lumin. Always use a soft cotton cloth. Do not use the Lumin near water sources. Keep away from the reach of children. Make sure you will not stack any items on your Lumin device. The Lumin sanitizer is a smart investment for anyone who needs to maintain CPAP equipment clean and sanitized. The device comes with an acceptable price tag, it is easy to operate and requires no maintenance whatsoever. Cleanig the outside of my CPAP and equipment is quick and easy. I can clean the inside of my equipment with anti biotoc soap, bleach and a number of other products but it is a time consuming pain. Why would I pay $249 for something that doesnt make that task easier? Why is this product better than the SoClean device? At least that one disinfects the inside of the equipment too. Am I missing something here? Unlike the SoClean which used ozone to clean your machine, the Lumin CPAP Cleaner uses UV light. Not that one is better than the other however many people are very sensitive to the smell of ozone and feel that it can be dangerous. We do not believe it is dangerous however the Lumin gives CPAP user the option as to which method they wish to use to clean their CPAP supplies. We disagree as to it not making the task easier. The Lumin CPAP Cleaner will kill 99.99% of the bacteria and germs on your supplies and equipment. 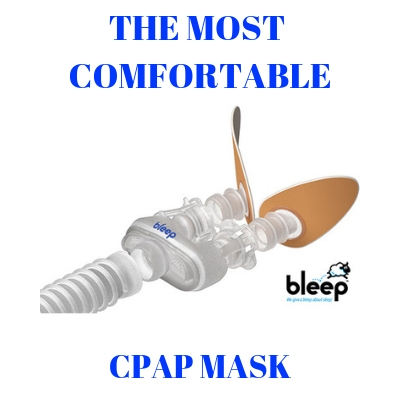 It is another choice available to the CPAP user. What is right for one person is not right for everyone. Lumin will not clean the hose. See the previous reply. Thank you. I do agree with John. I do like the the Lumin can also disinfect tooth brushes and other items. But I will stick with the SoClean since it also cleans the chamber of my CPAP and the hose. I recently purchased So Clean 2 and used it three times. The ozone is so strong it makes me sick. My head feels like it is going to explode. I refuse to use it anymore and it will go in the trash. That’s over$300 down the drain. I’m 88 and sure can’t afford to throw it away but have no choice. I owned a So Clean cleaner and because of the ozone I developed a rash around my nose and chin that would itch. I contacted So Clean and they told me to use wipes and I did but the problem persisted. I also read that the ozone itself was very bad for respiratory conditions such as COPD of which I have. Do the research. I would no recommend the So Clean device for these reasons. I decided to try Lumin. No Ozone. You are misinformed. 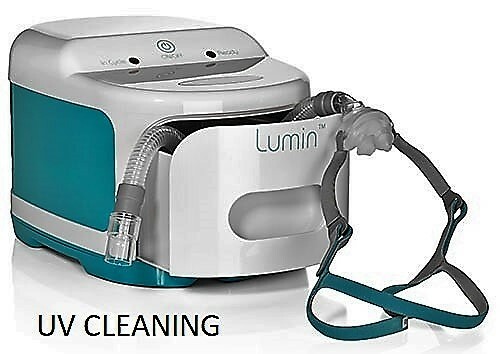 The Lumin CPAP Cleaner with clean and sanitize your CPAP Mask and your humidifier. Currently the Lumin will not clean your hose and the UV light cannot penetrate the skin of the hose. This is actually incorrect. The UV light can penetrate the hose, but not with as high of efficiency due to coiling and etc so they are therefore legally bound to state that it cannot disinfect. Unless the manufacturer states in writing that the machine will sanitize the hose we stand by our comment. I agree. I would think a huge amount of bacteria and/or mold would reside INSIDE the hose. Not cleaning this huge and vital area is a real drawback. You’d still inhale all that crap from the inside of your hose no matter how clean your humidifier and mask are. The SoClean ozone machine DOES clean the INSIDE of the hose. Drawbacks of the SoClean: Ozone is thought by many to be bad for you if you INHALE it, so duh. Also, you have to change a filter and check valve every 6 months. I don’t think either machine is good. I don’t want Ozone and a machine that doesn’t disinfect the INSIDE of the hose is worthless. When will the newer Lumin bullet be available that will clean the inside of the hoses/tubes? and will it be a stand alone or something to just attach to the current Lumin machine? Thank you for your question. 3B Products is stating that the “Bullet” which will be used to clean the hose when you are cleaning your CPAP machine will not be available till the end of 2018. When it is available it will be able to be used on ALL Lumin CPAP Cleaners already in use. Since I can see through the Cpap hose, why would it not disinfect it?? 3B Products say it will sanitize it but because there are so many hoses they have not tested the Lumin CPAP Sanitizer on each hose made and therefore, cannot state it will destroy 99.999% of bacteria. So, am I to understand that if my tubing is translucent, the UV light will, in fact, be able to sanitize the inside of the tubing? I cannot state that as a fact. I can only pass on what the manufacturer says. What will be the approximate cost of the Lumin Bullet? How will it work? Is the LM3000 the only model of the Lumin CPAP cleaner? There is only one model of the Lumin and we have been told that the Bullet will work on it. As for cost we have not been given any information. Today’s date is Mar 15. Is the Bullet available now Charles? It has not been release by #B products as of yet. Like you we are looking forward to it. If the Lumin can’t clean the inside of the hose or the nasal mask, I don’t believe it is what I need. I’ll wait for something that really works where cleaning is needed the most … inside. The Lumin will sanitize the inside of the mask. It is best to turn the mask facing up. How does anybody know if the SoClean even works? I’ve seen no test results – only testimonials from users. I have one, but am not sure if it does what it claims to do. I bought the Lumin and is very dissatisfied the only thing it cleans is your reservoir and mask so you have to manually clean your hose so whats the point in having it. I so wish I have bought the SoClean. Thanks. I will go for SoClean instead of Lumin. Do items have to be dry to use the Lumin? No they do not however there should not be excessive moisture. I still get some sort of odor emitting from the items being sanitized in the Lumin. I don’t know what the Ozone odor smells like so I can’t compare. Anyone have any ideas. Also not sanitizing the hose is a negative. I invested in the Lumin because of the ozone issue. If I had to do it over again I wouldn’t purchase either. Can’t beat good old soap and water, I think I got really lazy and bought into the new techology! What is the odor produced when using the Lumin. It is very offensive but can be rinsed of fairly easily but I am curious what would produce the smell? I use the Lumin regularly and am satisfied since I have no sore throats since starting it’s use. I do manually clean all the parts of my CPAP about once a week. What you are smelling is clean. The Lumin uses UV lights to sanitize your CPAP part and the only smell may be the newness of the machine breaking in. If the on/off button does not work please contact the people you purchased it from. I was foolish enough to buy it thinking that it would clean just like so clean but it does not clean the hose for the inside of anything I wasted $250. The Lumin is not able to state it can clean the hose as there are so many hoses on the market and not all are translucent. That being said 3B Products the manufacturer of the Cumin has an add on product called the Bullet which will be release in the next couple weeks to clean the hose with or without the Lumin CPAP Sanitizer. For people not hot about using an ozone cleaner the Lumin is a great alternative.